It's looking very good Brian! Very Smart! 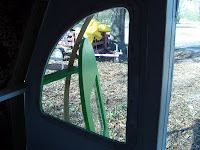 We were able to use plexiglass for our windows because we adapted our windows to be square. We could easily score first with a knife against a straight edge and then cut very slowly with a jigsaw, but you couldn't do that with the curved windows. Anyway, it sounds like you came up with a great compromise. Can't wait to hear about your travels in the wagon - wish you could come to Prince Edward Island, I'd love to see a little wagon collection in our yard!! Thanks, If I ever make it that far up north, I will stop by. We would love to meet our Canadian friends. This weekend will be a big weekend. I have to assemble a trailer and attach the tarp. That will only leave the door. Have to wait on that because we have found some nice victorian hinges we want to use. Anyway, thanks for the comments. I just reviewed your blog and I am impressed with what your family did. 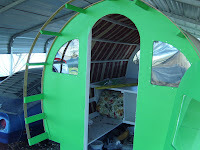 I have been searching for a light travel trailer plan and your success with this has convinced me to go with the gypsy caravan. I will use your experience to help me along the way. Thank so much.